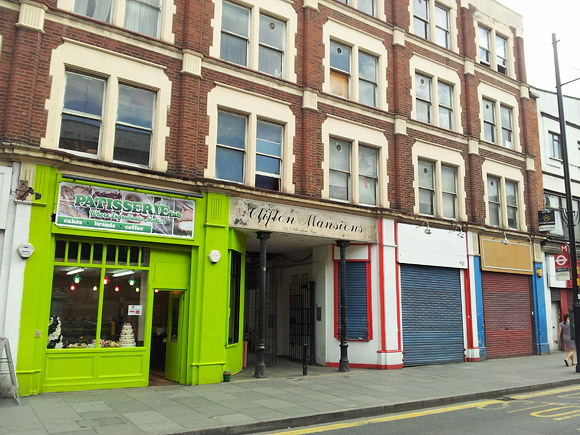 The social cleansing of Brixton continues with the news that several long-term squats in at least four different blocks have been given notice to quit. Update: we’ve heard that they’ve only been given two weeks notice, despite the fact that many have been residents there for decades. The news broke on this urban75 bulletin board thread – Rushcroft road: notice to quit – with posters noting that friends from at least four separate blocks had received eviction notices, with something like 40 flats targeted (8 flats in each of the five blocks). 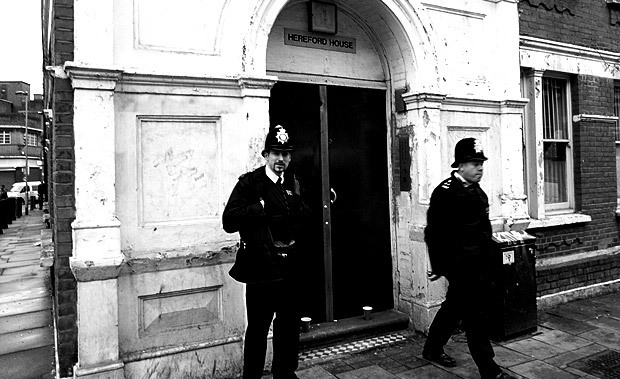 Until the recent wave of evictions, Rushcroft Road [and nearby Clifton Mansions] had been home to a mixed community of council tenants, council leaseholders, ex-housing association tenants and squatters, with many residents living on the estate for a generation. 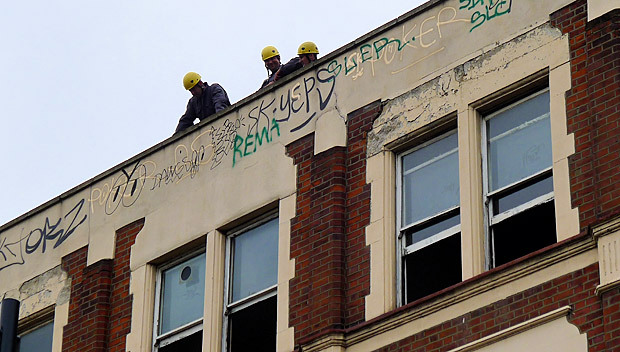 Lambeth Council has owned the flats since about 1975 when they were bought for demolition as part of an insane plan to build a motorway and high-rise council housing scheme in Brixton that would have unleashed the tallest public housing development in the world, outside of Chicago. 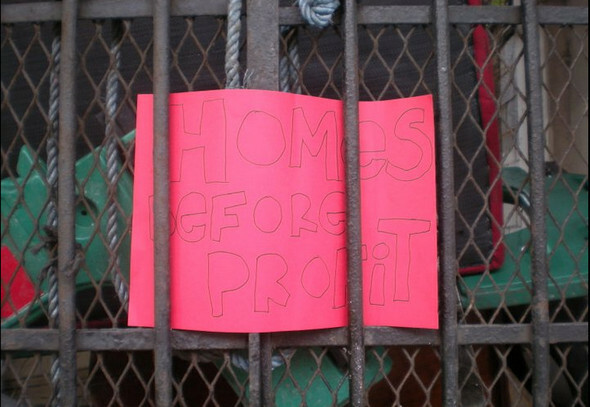 The plan was thankfully abandoned, and many of the properties were later occupied, with a strong squatting community forming – see the excellent article about how they formed a self help group in 2002 here. 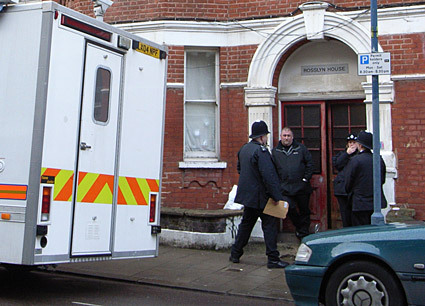 Lambeth intensified their efforts to evict the squatting community from early 2002 onwards, with the occupants of one block of eight flats in Rushcroft Road – Elmwood House – successfully being ‘decanted’ elsewhere. 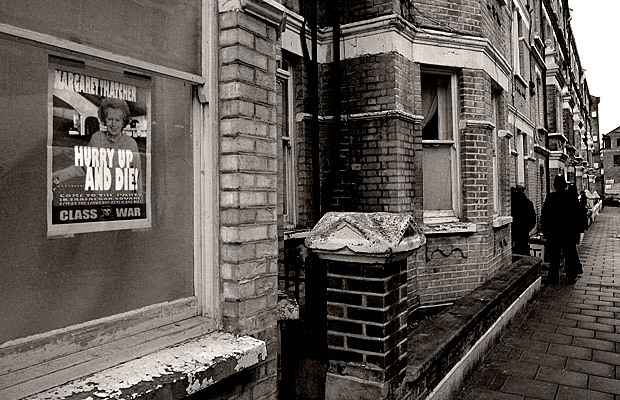 In 2003, more squatters were evicted, with this emotive article fired off in response : Selling Central Brixton to Yuppies, Brixton community under threat from greedy developers. 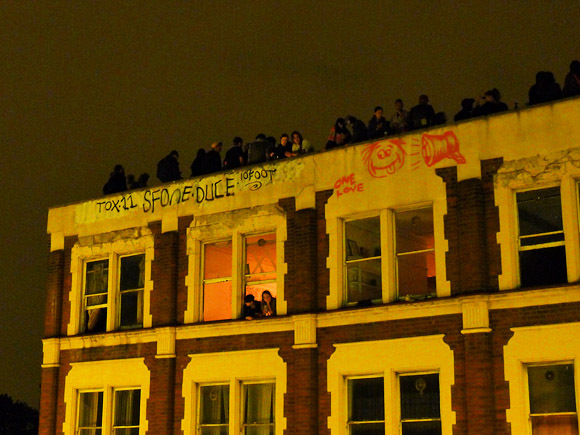 On the 10th March, 2009, two more well established squats at Hereford House and Rosslyn House were evicted by a large number of police (the photos above are all from this 2009 eviction). 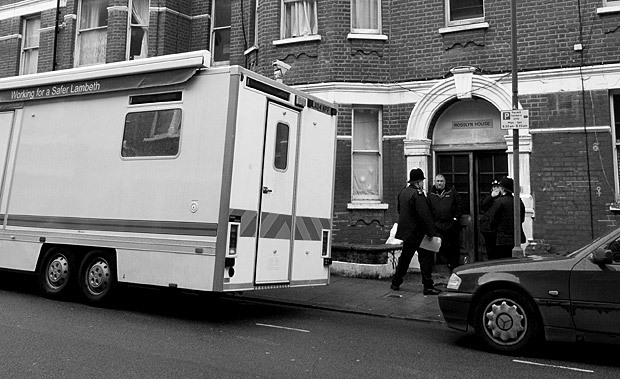 However, the biggest eviction of the lot was yet to come: that arrived in June 2011 when a regiment of cops sealed off Coldharbour Lane and cleared out the entire Clifton Mansions building. See the photo report here and read the urban75 discussion here (over 630 posts). 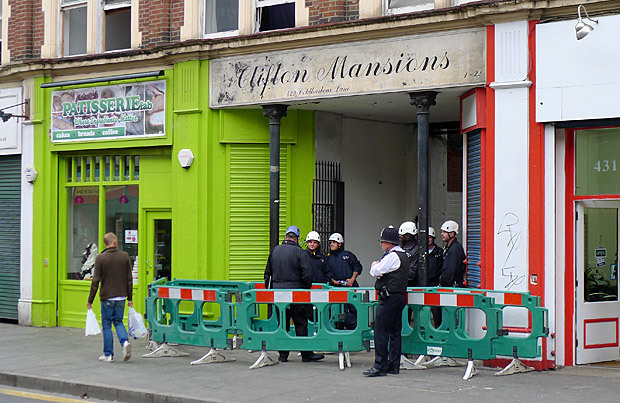 With each fresh eviction of these long term residents, Brixton becomes a little less about character and community and a bit more about money, profit, greed and all that ‘lifestyle’ cobblers that nu-Brixton developers and entrepreneurs like to peddle. 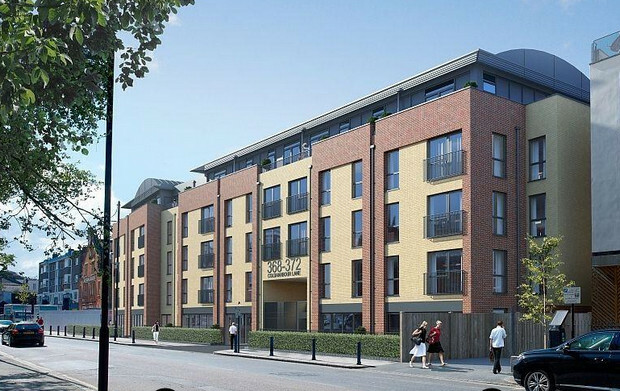 A short stroll down down the road, a private Barratt Homes development has utilised an ‘edgy’ graphic to represent their new Brixton Square development, with the name suggesting that we may be getting some sort of public square to enjoy. Of course we won’t, it’ll only be another semi-gated community, just like the ghastly one next to it. The real irony is that Barratt Homes are literally building on what was one of the best community spaces Brixton ever had: the much-loved and much missed Cooltan Arts community centre. I don’t think Brixton will ever see its like again. 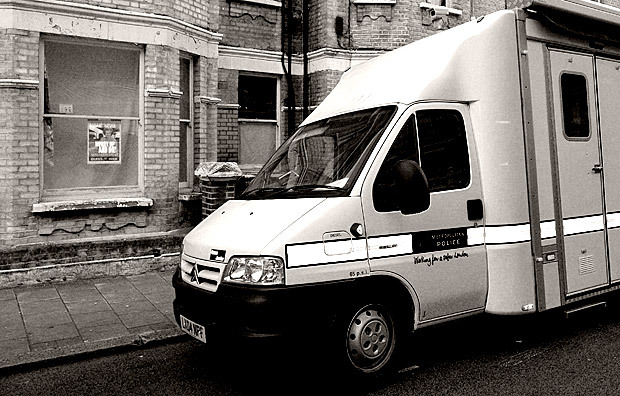 Read the thread about these latest Rushcroft Road evictions here.